You! Be Inspired! – What Time is it? Watches and other time pieces play an important role in our lives. Most of the time, they tell us whenever the cupcake you’re baking in the oven is already done, when the washing machine has just finished with your laundry or whenever you’re already fifteen minutes late at work. On the other hand, certain time pieces – aside from giving accurate time – serve as jewelry or works of art, showcasing excellent craftsmanship, design and engineering. From self-charging watches to touchscreen ones, here are some amazing designs from all over the world that will certainly give you a whale of a time. Made from stainless steel, the Kerala Trance watch from The One does not display time using traditional means. Instead, the watch uses 10 LEDs to tell time in Binary. The face of the watch is divided into two rows, with each LED representing a number in the Binary sequence (1,2,4,8,16 and 32). The top row represents the hours while the bottom row denotes the minutes. The values printed next to the illuminated LED can be added together to work out the time. According to the manufacturer, a person (given enough practice) will be able to read the time using this watch as easily as reading time on an ordinary watch. The watch is water-resistant at up to 90 feet and comes in a cool metal box with a full instruction booklet included. 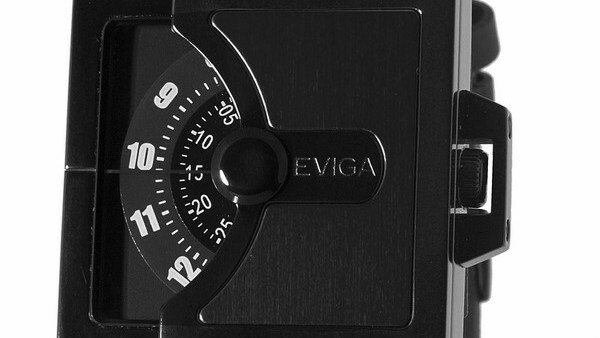 Eviga is a Michigan-based company that produces several lines of affordable fashion watches. Their Jazz line to be specific costs around $138 and comes in a variety of colors. Unlike standard watches, the Eviga Jazz features a rectangular face with a semi-circle cut-out at the side showing 2 sets of circular discs that show the hours and minutes. The watch’s band is made out of leather while the casing is made out of stainless steel. The watch is also water resistant up to 3 atm with a battery Japanese quartz movement. The ODC X-02 from Hamilton looks like something taken from a spy movie. The futuristic design of the watch was modeled after the cross-section of an aircraft wing, with the three pushers representing the blades or the engine of the plane. The watch also features three separate dials that each shows a different time zone. In terms of construction, the ODC X-01 is made from titanium with the face covered in scratch resistant sapphire crystal. It is also water-resistant up to a depth of 164 feet. Designed in France by watch maker Lip, the Automythic Radar looks like the combination dial of a bank vault. It features three moving dials under a fixed hand. The contemporary design of the watch makes use of rectangular and square design cues to give emphasis to the rotating dials – the only circular element in the watch’s design. The watch is made from stainless steel with the dial windows made from anti-reflective sapphire; and is water resistant up to a depth of 50 meters. The Ora Unica is probably one of those watches that would really make a good conversation piece. At first glance, the Ora Unica looks like a broken watch with no dials and no numbers. It just has a single strip of coiled metal at the center and that’s it. If you’re wondering how to read time on this watch, you just have to take note at the two ends of the white line (squiggle) which marks the hour and minute. Another innovative time piece comes from Nooka. Their Zirc line combines the familiarity of a clock face with the company’s intuitive concept of time. For starters, the face of the watch has no moving hands. Instead, it is divided into three sections. The first section consists of 12 dots representing hours. The second section is a horizontal bar that counts the minutes while the third section has indicators for alarm, AM and PM. The Zirc is water-resistant to up to 5 ATM and is powered by a CR2016 battery. The Seahope Avatar relatively has the same functionality as the Nooka Zirc. But instead of having a LCD panel that highlight dots, the Seahope avatar has three sets of LEDs to show you the time. Again, just like the Nooka Zirc, this watch is divided into three sections. The first section is a circular area that tells you the hour. At the bottom you will find a small horizontal bar that contains 5 lights to represent the 10, 20, 30, 40 and 50 minutes while the top bar has 9 lights to represent the minutes in between. The watch is made out of black stainless steel for its casing and genuine leather with heavy stitching for its band. The Starck O-Ring by Philippe Starck is one of the most futuristic watch designs in our list. The casing of this time piece is made from stainless steel while the band is made from Polyurethane. The design of the O-Ring combines both analog and digital methods of time reading. The most prominent feature of the watch is the hole in the center. Instead of having a mechanical hand pinned at the center, the O-ring uses a circular display to tell time. And just like the other items in this list, the Starck O-ring is also water resistant up to a depth of 3 ATM. Another interesting watch to talk about is the Ventura Sparc MGS W51. This state-of-the-art time piece sports an internal mechanism for producing its own power. This is done through a rotary mass which produces small amounts of electric energy every time you move your wrist. The energy produced is used for powering a micro-processor and the 250-segment 12-digit liquid crystal display. To top it all off, the device runs on Ventura’s proprietary operating system called EasySkroll v.2.0 which can be upgraded in the future. The Sparc MGS W51 is made out of Durinox case ( a type of tempered steel) while the display windows is covered by 2 sapphire crystals. Another piece that offers users a cool way of telling time is Ziiiro’s Gravity watch. The hands and numbers of a standard watch are replaced by 2 discs with colored swirls. The tip of the inner swirl tells you the current hour while the tip of the outer swirl represents the minutes. The case is made from the combination of two materials – stainless steel and silicone. Furthermore, the silicone part of the watch can be switched to accommodate different color straps. The Ziiiro gravity is water-resistant up to 30 meters and comes in 9 colors. Mute watch is the fashionable watch for tech geeks. This cool gadget packs a hidden capacitive touchscreen with a glowing display. Tapping the flat surface of the watch of flicking your wrist activates the touchscreen and shows you the current time. It also has an alarm and timer function that can be accessed by swiping horizontally. Alarms and timers can be set by tapping or swiping the top or bottom of each digit. And if that’s not enough, the Mute Watch has a vibrate function that acts as an extra notification for alarms. The touchscreen together with the LED display comes with a price though; the batter of the Mute Watch will only last for 3-4 days before it needs a recharge via a USB connection to your computer. So which of these watches has the most innovative design? Tell us by leaving a comment below. You can also hit us up on Facebook, Twitter and Google Plus. Our RSS feeds are also open for subscription if you want to get the latest and freshest news in the world of design.